My grandparents told me about an event that happened in World War II; how two Stukas avoided detection and bombed Brighton without warning during 1940. We sat round the old dining room table in my Grandparent’s house; which in itself seemed to be in a time warp in 1976; having not changed much over the 36 years after the incident. My Grand-dad said that it was a memorable day, bright sunshine and quite warm. He took my mum and aunt to the local sweet shop at the bottom of Islingword Road, which is still there today. Returning home from the sweet shop, Grand-dad was clutching the children’s hands as they were just going to turn the corner into Hanover Street. It was then he heard a weird shrieking siren sound. At the time he wasn’t really aware of anything that made such a racket, other than the air-raid siren. But as luck would have it, he spotted a shadow of a plane on the road. He was then greeted by the sound of bullets ricocheting off garden walls down the street. It was then that he then realized that it was no friendly aircraft. Quickly he picked my aunt up and pushed my mum behind a wall. The plane swept in low and fast… it was a Stuka. As the first plane swept past there was an almighty bang, the ground shook and the sound of glass shattering everywhere filled the air. A second Stuka dropped a huge bomb on the brewery at the other end of the street. Then, when eventually silence fell over the area and the two Stukas left the scene of devastation, my Grand-dad put his head over the wall and noticed the brewery was in flames, smoke bellowing everywhere and virtually every house had smashed front windows. Quickly he dragged the tearful kids as fast they could go to see what had happened to Nan. He found the door had been flung open by the blast and my Nan was lying on the floor at the bottom of the stairs. She was quite shaken, but ok nonetheless. It was then that my Nan added that she heard the racket of the planes swooping over the house and went to the front door to shut it, realizing that the planes could be enemy ones. She just managed to shut the door, but the force of the bomb blast threw it open again and blew her across the floor, and shattered most of the glass on the front of the house. There was no apparent warning that either planes had managed to make their way into the area; otherwise Nan would have been in the small air-raid cage for protection and granddad with the kids would have found their way to an air raid shelter. Grand-dad said he spent a great deal of time clearing away glass and sweeping squashed bullets from the edge of the street after the raid. After telling me about the event, Nan pointed out skid marks on some of the walls of neighbouring houses, apparently those made by bullets left by one of the Stukas as it swooped down Hanover Street. This is one of the many war time stories I heard from my Grandparents, when I was a child. Wow, what an exciting story, though I bet that wasn’t how Peter’s grandparents felt about it at the time. The only doubt I’d offer is that Stukas were involved – these were dive-bombers rather than low-level attack aircraft, and lacked the range, the speed and adequate fixed gunnery for unescorted low-level nuisance raids of this type into areas where the Luftwaffe didn’t have guaranteed air superiority. I believe I’m right in saying that after the mauling Stukas took from the RAF during the earliest attacks on the Kent radar stations, they were never used again against the UK. Of course, if anyone else knows better ..? 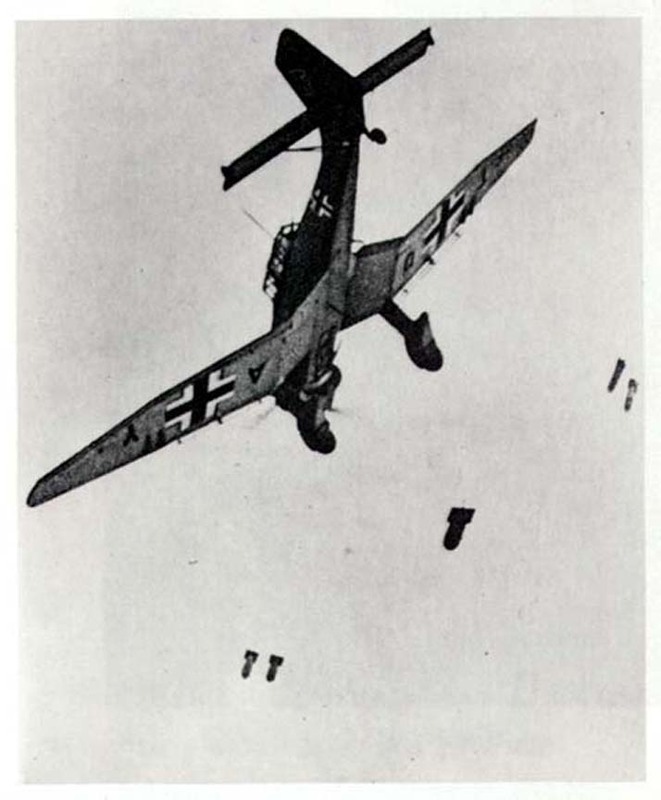 I’d suggest that the attackers in Peter’s story were more likely to have been Messerschmitt Bf.109 fighters carrying 250kg bombs, or just possibly early Focke-Wulf Fw.190s, likewise. The destruction of part of the London Road railway viaduct three years later was carried out by a single Fw.190 which scored an extremely lucky hit. The German planes often straffed London Road with bullets possibly just before leaving England for Germany. Sometimes the planes dumped the empty belts onto the road. A double decker bus was hit (the passengers had gone to a shelter). Many of the shops -Woolworths was one – were used in the war effort. Does anyone remember the houses in Gloucester Road being bombed? Also the school Dental Clinic, I think in Sussex Street, Rosehill Terrace etc?